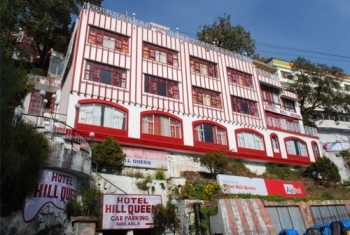 Hotel Hill Queen Mussoorie on the main Mall Road, amidst serene natural greens, Hill Queen is sitting pretty as a picture. The air is pure and inspires one to rise early for a crisp morning walk or go jogging/cycling down the quiet roads. Hotel Hill Queen in Mussoorie has 60 rooms, which include Deluxe rooms, Semi Deluxe rooms, Super Deluxe rooms and Family rooms. The hotel has an in-house multi-cuisine restaurant. The hotel also provides sightseeing packages to the tourists. The multi cuisine restaurant in Hill Queen Hotel offers varied cuisines from all over in Mussoorie. Our trained chefs having multiple experience will definitely serve you the finger licking delicacies, be it Indian, Mughlai, continental or Chinese, you would definitely have a wonderful experience. In Hotel Hill Queen, we welcome the Business Executives with Open Arms our commitment is to accommodate Mid and Senior cadre Executives in Rooms/Suites befitting their Status at Rates comfortable with their Company’s T.A. Entitlement Scales. Please ask for special packages tailor-made to match your In-house conference plans. Nearest Airport from Hotel Hill Queen is Jolly Grant in Dehradun - 60 kms and nearest Railhead in Dehradun is 35 kms from hotel.